My latest project is this time something completely different. I am part of a team that is working on a so called “Pen and Paper Podcast”. The basic idea is to post process the audio recording of a round of pen and paper by stripping off boring parts and adding sound effects and ambient sounds and music. We are a team of ten people consisting of graphic designers, web designers, story tellers, speakers and a narrator. Everybody is working with a lot of commitment and heart on the project to make it as good as possible. Check out our website to get more information about Brooks Vermächtnis! The near future… the year 3000. The world is invaded by smombies. Since everyone is looking at their smartphones all the time, the driving tests have been adjusted: Learner driver have to write messages on their phone while they drive! Will you pass the test and qualify as a citizen on earth in the 31th century? Find it out! You will need your PC and your Smartphone to play this game. No app is needed you can play the game in your smartphone browser. Background: Developed in 48 hours at the InnoGames Game Jam #11. My good friend Lukas and I released our very first app for Android on the 25th of March to the Google Play Store! It is a drinking game we developed. After developing the game as a dice game with real dices, we decided to make a digital version out of the game. We developed the game with Unity 3D in a time frame of about three months. While Lukas did the animations I did the programming part in the project. Check the game out in the Google Play Store! 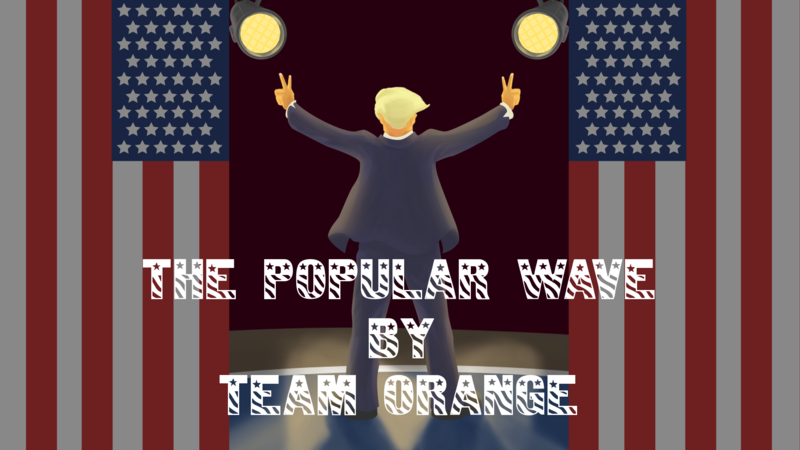 In the game “The popular Wave” the player takes over the role of the president of a country. One of the responsibilities of the president is to travel through the country and hold speeches in front of the people. Unfortunately not everyone seems to be enjoying the words of the president as much as he wishes. How would the press react if the people at a speech of our beloved president are not fully enthusiastic about his words? Better motivate the people to keep waving by giving them a persuasive gaze. The game was designed for the eye tracking system Tobii Eyex which made it possible to play the game only by looking at the screen. However the game can also be played with a standard mouse. Background: Developed in 48 hours for the Global Game Jam 2017. From the 28th to the 30th of November I attended the 10th InnoGames Game Jam at the office in Hamburg. With a team of six (three artists and three developers) I developed a Point and Click Adventure with a story about the theme “Time Cheating“. We had a lot of fun creating the game. On Sunday the games of all participants (more than 150) were presented. Afterwards, in a time frame of 48 hours, all participants could vote for their favorite game. We are really happy that we could get the most votes to become the “winner” of the IGJAM 10. After six months of work it is finally done. My thesis is submitted, the colloquium is held and I am finished with my studies. I am very proud of what I achieved in the project of my thesis. The document can be found here. From November on I will be working as a full-time Software Developer at InnoGames in the same team I worked as a working student during my studies. I hope to have the opportunity to continue working on the AI to eventually bring it into the game. But for now I will relax and enjoy one and a half month of doing… not much! Today I started working on my Master Thesis, which is a project carried out during six months in cooperation with InnoGames, where I currently work as a working student. The topic of my thesis is “Conception and Implementation of an Artificial Intelligence for an Online Multiplayer Game“.